The Adults are approximately 1/2 in. long; wings light brown with darker veins and spread about 1 1/4 in. Males with yellow patches near center of forehead, and antennae broader and more feathery. Moths fly mostly at dusk. Eggs are laid on the undersides of leaves, usually in clusters of 2-40; round, fresh eggs are white and later, near hatching, with red centers. May be laid on bark, or on buildings and fences. The larvae are very small upon hatching; sixth instar about 1 1/4 in. long, dark olive green with black and yellow longitudinal stripes on back and sides. 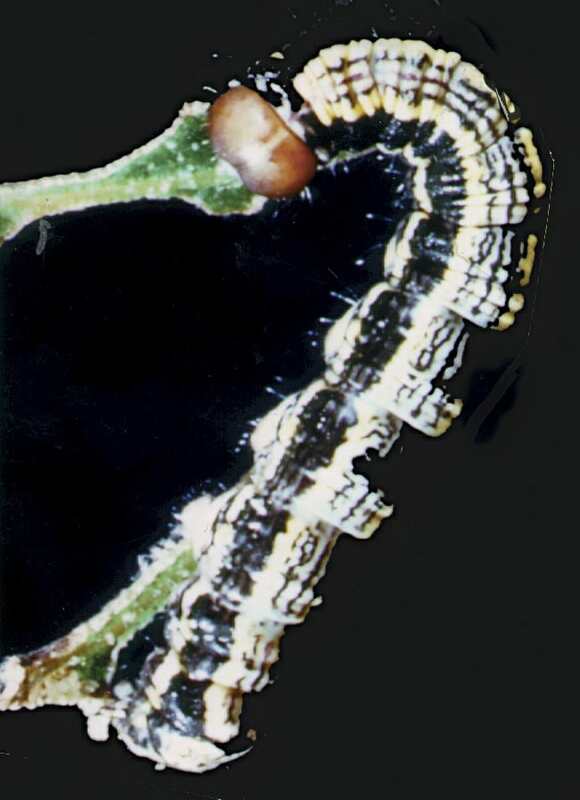 Young larvae, with oversized heads, feed by removing only one surface of the leaf. The third or fourth instars feed completely through leaves and exfoliate the tree. The larvae hang on silk strands from leaves. The pupae develop on all parts of oaks or other trees nearby, fences, buildings, other convenient objects. Red brown with brown and tan longitudinal stripes on rear. Adults emerge mostly in May, June and July. Hosts include all oaks in varying degrees and are found throughout the United States: California favoring 300 Degree days (at 650 F.). Leaves brown from feeding by young larvae; large areas of young leaves chewed by older larvae, defoliating growing tips. Severe infestations defoliate entire sections or the entire crown, especially in the San Francisco Bay area. Repeated annual defoliation may kill some trees. Live oaks are more seriously damaged than others since eggs and pupae drop to ground from deciduous species. Young larvae hanging from silk threads, frass, and falling excrement are nuisances around pools and patios. Two complete generations except in southern California, where there may be a third. Overwintering usually by eggs, but there also may be young larvae. Larval stage usually less than one month. Adults emerge between May and July. Second generation of adults in late September.